US President Barack Obama and Cuban leader Raul Castro agreed to normalize the relationship in December but there is nothing to ensure a smooth process. The 50-year period of conflicts and mutual claims cannot be simply forgotten. The enrooted mistrust of the Cuban leadership towards the United States is hard to overcome. There is a growing conviction in Havana that the imperialist enemy will not miss an opportunity to deliver a deadly strike against the country of victorious socialism. This point of view is permanently set in the mindset of veteran revolutionaries who have determined the strategy of the country’s development. The same applies to the pragmatic generation of Communist leaders who have launched the process of gradual political and economic modernization. Cuba is resolved to maintain its independence and protect the gains of the revolution. The people support the reforms, including the democratization of political and social life. It’s important to define the pace of changes and create economic basis for improving living conditions of common people. 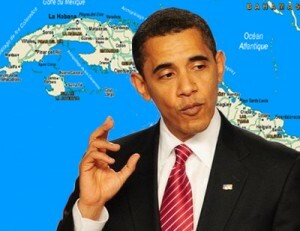 Washington is not interested in the evolutional pattern of Cuba’s development. Paul Craig Roberts, a well-known US economist and politician, expressed the opinion that Obama will turn the US embassy in Havana into an instrument used to implement his hostile intentions. The United States will use non-governmental organizations for inciting street protests like it was done in Ukraine. There are a growing number of posts to Twitter saying that, no matter the White House sounds soft on Cuba, the US special services are concentrated on organizing Cuban Maidan demonstrations. The protests could be even more radical. Anti-Cuban subversive centers function in the US, Canada and Europe dissipating information about «luxurious life» of Cuban high standing Communist Party functionaries and government officials isolated from common people. The information on corruption in the ranks of state and party officials is an important aspect of the non-government organizations under the control of US special services. Their mission is to undermine stability, law and order in Cuba. Normally the corruption fighters use the materials fabricated by the US Central Intelligence Agency and the National Security Agency. Since a long time ago the US mission in Havana has been involved in the activities aimed at establishing non-government organizations, including training of «young opposition» and their introduction to the methods used for staging «color revolutions». American diplomats seldom openly call for the fight against the «Castro regime». Instead they display great fervor making comments on the chosen episodes of documentary films devoted to «color revolutions» and overthrow of tyrants and dictators! They provide deep insight into the activities conducted by young activists of protest movements in other countries. They admire their readiness for self-sacrifice pursuing the ideas of democracy and humanism embodied in America! Yoani Sanchez has been spreading anti-government information with a hostile intent for a number of years. Her success evokes envy in the ranks of dissidents: she gets well paid and is often invited to make foreign trips. As a human rights activist, Yoani receives prestigious awards. It is said she may be nominated for Nobel Peace Prize. And she has followers. Immediately after the scandalous relationship between Sanchez and the CIA was revealed to become public domain, new opposition activists took the positions at the front line of struggle against «the dictatorship of Castro brothers», especially Eliecer Ávila. He attracted the attention of anti-Cuban subversive centers in 2008 when he asked some Ricardo Alarcón de Quesada, the President of the National Assembly of People’s Power, a few sharp questions about the freedom of press, direct access to Internet and the weak points of the Cuba’s election system. Alarcon answered candidly and adduced solid arguments. That was it, so it seemed to be then, but somebody made a video recording of the meeting. The fragment with the recorded event and the curious student asking hot questions was shown in American TV programs devoted to Cuba, as well as European TV channels. All of a sudden Eliecer Ávila became famous. A simple peasant from province who received higher education in Cuba (he received a degree in information technology) became known. It made his head go round. Then the same pattern as in the case of Yoani Sanchez was used to get him into public spotlight. Western media outlets paint him as a competent expert on Cuba, a potential political leader able to form and lead a political organization (and do it pretty soon) which could take the place of incumbent Communist Party. CIA sponsors arranged a foreign trip for him (Sweden, the Czech Republic, Poland, France, Spain, the United States and other places) so that he could know what real democracies are like. During the tour they held discussions to shape his opinion on the formation of new party. At present one can only guess what is in store for Ávila and what his political career path would be like. Ill-wishers spread the rumors among dissidents that Ávila collaborates with the Cuban counter-intelligence. That’s why he is so passive when it comes to opposing the regime. There are around twenty-thirty non-government organizations operating in Cuba. One way or another, they coordinate their activities with the United States Interests Section of the Embassy of Switzerland in Havana. The Ladies in White (Las Damas de Blanco) is the best known organization which stages protests against «the Castro regime» and the politically motivated imprisonments. There are 53 people imprisoned in Cuba for political reasons, according to the US State Department’s list. In the given case the word «political» has a rather dubious meaning. At that the Cuban government started to release the prisoners in accordance with the agreement concluded with President Obama. One can tell a lot about the sophisticated operations of US special services in Cuba. The USAID activities among young music fans, especially rappers, are a good example. They used front organizations to promote the band called Los Aldeanos. Other musicians were invited to join in. They planned to organize a festival as a way to spread around «fresh ideas». The «rap operation» was conducted along with other subversive activities. For instance, USAID launched the project ZunZuneo, a Cuban Twitter, calling for political struggle against the government. At the same Cuban tours were organized for the young people coming from other Latin America countries so that they could instigate their Cuban contemporaries to anti-government uprisings. All these plans have been frustrated but the looming détente in the US-Cuba bilateral relations opened new opportunities for the enemies of Cuban revolution. The US Interest Section in Havana is not idle as the process of its transformation into the full-fledged embassy has been launched. The complex plan of preparing a «color revolution» is being gradually implemented. The just started reduction of tensions is used as a cover. The US special services never stop rehearsals to prepare potential actors for the roles in the play called «Maidan-style performance».